AA667D2S5/2GB is an INDUSTRY STANDARD 2GB SDRAM DDR2-667MHz/PC2-5300 200-pin SODIMM for Laptops (HP, Dell, IBM/Lenovo, etc.). 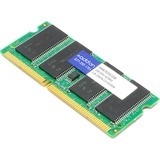 This memory module is built to JEDEC Standards, to meet or exceed the Tier 1 OEM's factory requirements. All AddOn memory products are 100% tested and 100% guaranteed to be compatible with the systems it is intended for.